It's not a stretch to say that these dog onesies are pawsitively adorable. 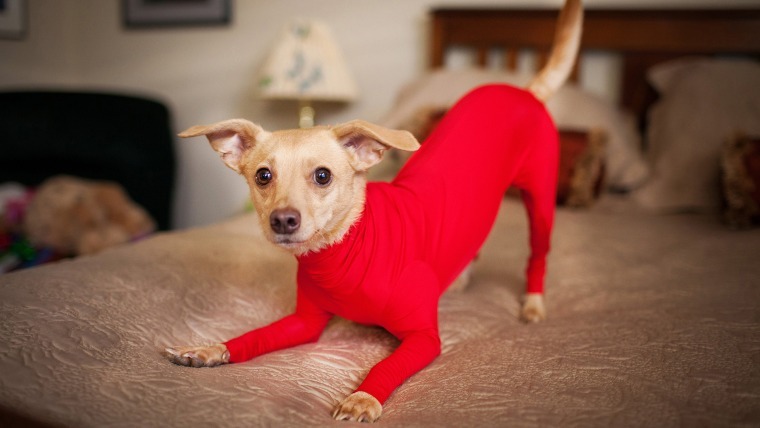 Leotards for dogs exist, and there's a good reason why. Six or seven years ago, Tyson Walters went searching for a product that would help control his big, fluffy dog Harley's "tumbleweeds of hair blowing across our hardwood floor," as he puts it. "I searched endlessly," Walters, 31, told TODAY in an email. "But to my amazement I found that there was nothing on the market to solve this problem, so I took it upon myself to create something that would." That something is the Shed Defender, a stretchy, machine-washable garment for your dog designed to be worn when you want to keep his or her fur contained. Or, when you'd just like to enjoy seeing your pup in an adorable dog leotard. The Shed Defender has been on the market for around a year now (it's also available on Amazon). Walters declines to provide sales figures, but there's no denying a widespread and ongoing fascination, generating a huge amount of buzz. Walters is not surprised. "There is no other product like it, and most people have never seen a dog in a onesie," Walters said. Cuteness is, obviously, guaranteed. What about safety for your pooch? No matter how much your dog sheds, and how much you love seeing your dog in a onesie, the Shed Defender is meant to be worn a few hours at a time, not for days on end. "While it could help to keep the hair that is being shed from falling into the environment, it also traps all of that hair and even skin that is normally being shed," said Jason Pieper, a veterinary dermatologist and assistant professor at the University of Illinois College of Veterinary Medicine. "If you are inhibiting this by covering the skin and trapping it in," he added, "this could cause other problems such as infections. Granted, if it is being used for a short time and cleaned regularly, then I think it could be beneficial." Veterinarian Katy Nelson, host of "The Pet Show," agrees. The dog leotard is "a short term solution in situations where shedding is problematic. But not as an everyday garment," she said. "Also how do they pee and poop?" Walters agrees that the Shed Defender is "meant for situational use, and not prolonged use. And we don’t believe dogs should wear clothes 24 hours a day unless it’s for medical reasons — and in those cases, it should be discussed with a vet." As for the peeing and pooping question, it is so common that it's addressed on the company website: "When the dog is wearing the Shed Defender outside, such as on a walk or needs to go to the bathroom, just partially unzip it allowing room for them to do their business." Walters has big plans for the future. The company already donates products and money to shelters and animal rescue groups, encouraging folks to reach out if they know organizations that could use more help; Walters is hoping to turn this into a more formalized "Paw it Forward" program soon. He's also busy creating leotard models for hard-to-fit dogs like corgis, basset hounds and English bulldogs — as well as new colors and prints, sleeveless and crotchless onesies, versions made of thicker fabrics for colder climates and more. Thinking very ambitiously, there may even be a special new onesie coming ... for cats. As for Harley — Walters' inspiration and muse — she remains happy to wear her leotard. "She knows it’s time to put it on when we walk to the car or go into grandma's and grandpa's house," Walters said. "Once we put it on, she gives a quick shake and then continues on like it’s not even on her."